That's so good. I've never seen my mom do this as she got only store bought ones. Also, I have a faint rememberance of my granny doing it.Thanks for sharing the step by step pics. Looks yummy with the crackers. have you seen this post about cultured butter? Thats a great post. Even today at my in-laws place they curn the yoghurt & take out the butter & use it... as u said tastes heavenly.. the fresh ones are always better! Butter on my parantha, aha :).Very helpful post, Manisha. My mom makes "loni/toop" the same way!!! How nostalgic! I mean the wooden churner/ravi way. I have started using "organic ghee" from whole foods, these days. I just can't wait to do it. Thank you. Can we use a blender in whip mode instead of shaking ? May be not. You're all set for gobhi or mooli paranthas - fresh white butter is divine over those! But use a little more than a few drops of oil to crispen the paranthas to a gold first - oh the tastes of winter (or heaven)! Manisha..that post took me down the memory lane,it was my duty at churning ever since my 5th standard,with ravi in the lovely china-clay pot and a small pail of water to wet palms while churning!Later,post marriage, when my MIL used to gather only the thick malai from buffalo milk,churn it and get equal quantity of butter,I realised there was another way of obtaining butter as well!Now after half a decade you expose me to yet another innovative way of obtaining butter! shall surely try this..and yes..there is absolutely no match to white loni, in taste or color!! tks for posting! I always thought the source of the milk 'mhais' v/s 'gaaya' contributed majorly to the colour difference. The loni looks great! Love the nakshi as well. hers came out sooo yellow...and she used yoghurt and you didnt use any?? the butter just separated?? A grandmother in the extended family had a huge wooden churner attached to a pillar in her house, which we kids used to operate with the help of a rope that was tied to it - we always looked forward to those visits. That was one fun memory your post churned up! I made sweet-cream butter once when I was a kid- used a mixer and went past "stiff peaks" with the whipping cream. It was lovely stuff indeed, but I must admit that I have a great curiosity to taste a cultured butter made the several-day-of-collecting way, as there must be a noticeable difference in flavour. Amazing, and who would know it's so easy! Thanks! 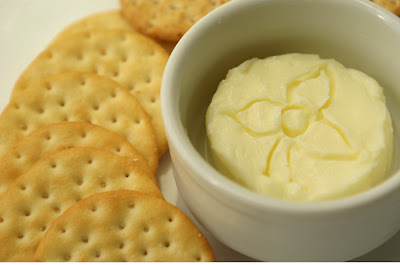 The butter looks soooo goood Manisha! I must masquerade it as a new game when I visit my frnds :)I love it with some sugar added and a dollop over hot-off-the-pan Adai is divine ! And hey, I made a tiny trip to Grand Canyon over the long weekend and got myself a dream catcher :) Will post pics soon. This brings back sooo many childhood memories!lovely post. We get Royal Crest, so I'll have to try this the next week. I'll make sure and get some heavy whipping cream! Thanks! I always think of trying it, but forget to get the cream. Homemade butter with garam garam aloo, gobhi, muli paranthas, ah heaven. Thanks for the post. my mom and MIL still make it in India. Just kidding, the butter actually looks really good, never made any. Ghee my Mom used to but not butter. I liked the floral design on the pat of butter too, very personalized. Great idea! My sister has done this before, although I believe she added a few marbles for the shaking. I wonder if that would make it go more quickly? Well it's summer all year round here so you bet I am going to try this. Thank you! Oh question if I want salted butter, do I just add the salt to the milk before I start the shaking? I kept wondering what "docile guy" Sandeepa was talking about....lol she meant 'gaaya' - holi cow! I am glad this post evoked memories for a lot of you! And thank you for sharing your experiences here. A big group hug to all of you! Bee, thanks for that link. 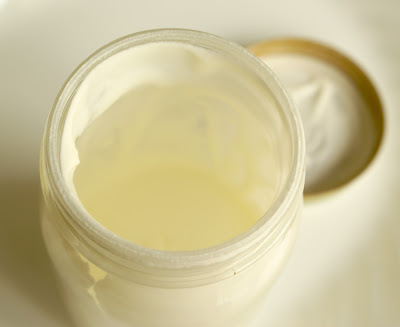 I've seen cultured butter and from the link that Rachna posted, you can make it at home, too. I'm not sure I agree with using ghee liberally though. My thoughts are more aligned with the ones expressed by Andrew Weil - mix some ghee for the flavor! Sandy C., it's easy to make and your daughter can have fun doing it with you. Use a smaller jar for her. Meera, I'm waiting for my local Wild Oats to change to Whole Foods - less crowds than the one in Boulder. I haven't seen organic ghee there yet. But truth be told, we don't consume much ghee or butter. Which is why this is nice - make some when you need it and it takes all of 5 minutes or so! Archana, I am sure you can but I haven't tried it. You will need to ensure that the cream does not get heated in the blender. Do let me know if you try it! Purnima, it's not exactly like the homemade loni but it's pretty good! Try it! TC, within the Indian context, yes. Buffalo milk leads to whiter everything. Buffalo milk is considered to be superior in quality to cow's milk in more ways than one. 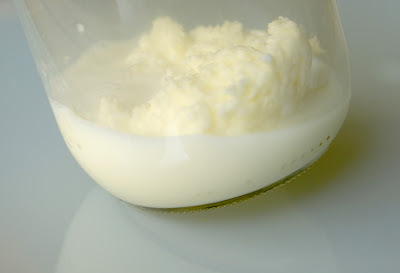 Cow's milk results in butter that is yellow in color. Also, as you no doubt know, only ghee from cow's milk is used for (Hindu) religious ceremonies or on auspicious occasions. Within the global context, I think it is more cow's milk than buffalo milk that is used. In countries like the US, where the diet of the cow changes based on the season, the color of butter varies based on the amount of carotene in the diet. Some species of cows process the carotene better than others, resulting in less yellow butter. In order to maintain consistency of color, the manufacturers use a coloring agent in the butter. Look at the ingredients of your butter and you will probably see annatto or food coloring in the list. Nakshi?! It's a crude attempt to replicate the stamp on the wooden butter mold that was used at the farm. Unfortunately, I don't have pictures of the stamps and molds but they looked a lot like these. Rachna, thanks for that link! I might try it one of these days purely for nostalgia! The milk she used must have been from cows that had a lot of carotene in their diet! The butter she made is cultured butter whereas the one I made is sweet cream butter i.e. no culture, pure fat. I think the problem you may have had was that the fresh cream was warmer than optimal and not because you didn't have yogurt culture. It needs to be cold for the fat to separate due to the agitation. Melissa's link mentions 60F as the temperature. My mother added ice cold water to the cream before churning it. And when we were at the farm, the cream was kept on ice to keep it cool. Give it a try. I made the butter in this post yesterday, if it helps any! 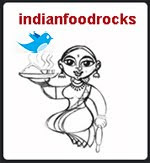 Pel, check out the link that Rachna posted. That will lead you to the flavor of homemade cultured butter. Priya, great idea! I used to hate putting the cream on my face, too! My husband loves to have the cream as is on toast. The less said about that the better! Am looking forward to your Grand Canyon pics! Confabulous, you must be in the Denver metro area then! Welcome to IFR! It's always great to connect with another local blogger! 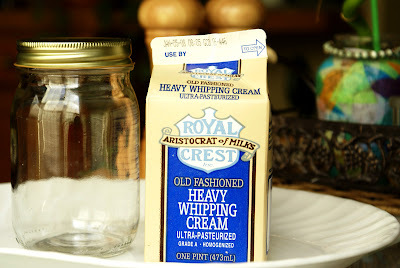 Ask for whipping cream in your next delivery and go for it! BTW, have you tried their eggnog and is it worth the calories? Suganya, this was in India? 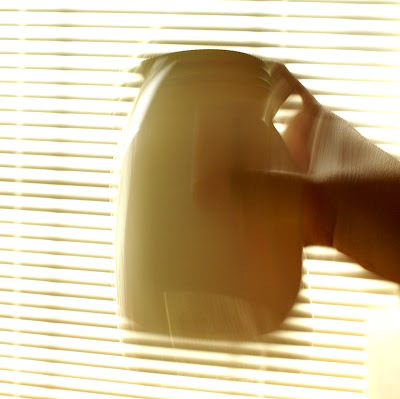 I heard of this 'shaking jar' method only recently! Now stop making fun of my butter art! Kelli, I am not sure I would add marbles because I am paranoid about tiny shards of glass that might come off the marbles or the glass jar when agitated like that. Small wooden balls would be something that I might be more inclined to try. And I think, yes, it would make the butter separate quicker simply because you have more agitation. One more thing to try! Marysmom, she got wiped out from the Wii?! Cynthia, remember to keep the cream cool. Honestly, I don't know but if I had to do it, I would mix in the salt after I have drained off the buttermilk. Anita, thanks for that docile guy/gaiya tip! I was the tubelight today! home -made butter are so tasty (makes me nostalgic too about my childhood),we do make ghee itself whenever we have got loads of cream in our refrigerator ,while me and maa-in-law makes it by slighly mixing in a blender ,butter is on the top layer and the mattha in the bottom .thanks for coming to my place ,its always apleasure. i remember another one ,maiya mori main nahi makhan khao. 42 male I used to milk the cow and churn butter at my grannies house I was about 4 years old then. I still crave the taste of home churned butter. Our kids will never know the true blessings we had back then. If I want to use this butter for baking can someone give me a rough idea as to how much of this homemade butter would I need to substitute for store brought butter as this one has more water content compared to the store one.Thank you in advance and thanks for this lovely trick of making homemade butter!